A common topic of conversation in the children’s book industry is diversity. From authors and illustrators to publishers, publicists and reviewers – are we doing enough to engage all children from all different backgrounds in books? Children aged between 6 and 11 consistently look for books in which they see themselves reflected – characters who look like them. At a recent seminar at the London Book Fair, Inclusive Minds talked about turning that conversation into action. 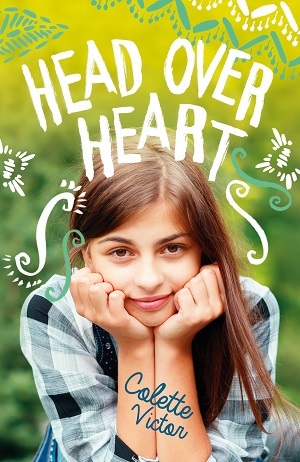 Last year, Chicken House published a book called Head Over Heart by Colette Victor. It’s a lovely coming-of-age tale about thirteen year old Zeyneb who is struggling to juggle her life just like any other teen – schoolwork, family, friends, future, feelings for a boy – but she has another issue, in that as a Muslim girl coming of age, she needs to decide whether to start wearing a headscarf or not. The thing is, I’m not recommending this novel because it’s inclusive and features a Muslim character. That’s just an added bonus. It’s a compelling well-written read, with a lovely description of a father/daughter relationship, and a beautiful depiction of what it’s like to first fancy a boy. Zeyneb struggles to follow the ground rules that her parents have set out for her, and struggles in her frustration to communicate with her parents. This is a common teenage trait and Colette Victor portrays it adeptly. I warmed to Zeyneb’s character from the first page, and continued to sympathise with her throughout the book. I liked that she is an ordinary, good girl – there’s no dramatic action here or tale of the unusual – it’s an everyday story with believable relationships and simpatico characters, and woven into the story are all sorts of components that form the life of a British Muslim – which meat she can eat at a friends’ barbecue, whether she can see a boy alone or not, the scope of her freedom, and her perception of her non-Muslim friends. This is for my older readers though – definitely recommend for about 11+ years. You can purchase a copy from Waterstones here. The Jewish festival of Passover is an interesting festival for me because it’s all about storytelling. Commonly, Jewish people retell the story of the exodus of the Jewish people from Egypt over a meal. 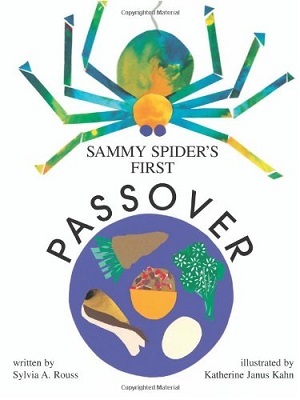 There are many children’s books on the market for Passover, because there is quite a lot about the festival that needs explanation for children – why bread isn’t eaten, why a special meal (the seder) is held, why it lasts for eight days, and the story of the exodus itself. “Time to get our kids to bed. 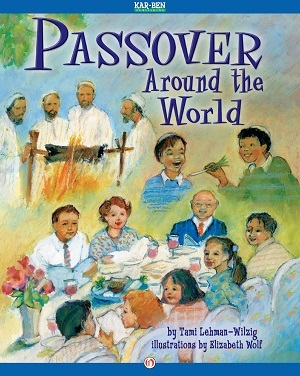 Lastly, and for slightly older children is Passover Around the World by Tami Lehman-Wilzig, illustrated by Elizabeth Wolf. Many families delight in reading about the different customs that different strands of the religion or people of different nationalities bring to the seder table. Although it’s traditional to have the same format every year, it is great to learn about other ways too. This book features stories, recipes and histories of Jews in America, Gibraltar, Turkey, Ethiopia, India, Israel, Iran and Morocco. From the brick of Gibraltar to the Mimouna celebration in Morocco, these are all intriguing customs, with a great glossary at the back to help. 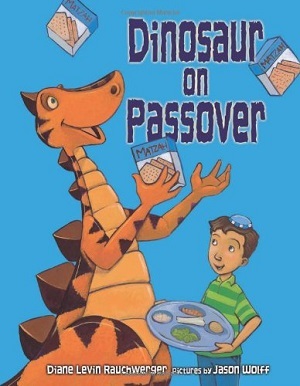 A useful and different addition to any child’s Passover bookcase. To buy this title, click here. His unflinching honesty is touching to read and beautifully juxtaposed with the extreme emotions of Sasha, as the reader sees her relationship with her father, teachers and peers through her adolescent eyes. 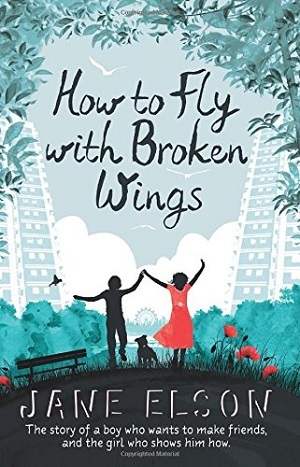 Jane Elson also manages to draw into the story the tale of war-flying spitfires, as a man arrives on the estate who tries to give the rioting youth a sense of purpose, history and pride. She cleverly weaves together the bullying of Willem as he is goaded to jump from a too-high wall: “If Finn Madison shouts jump you jump or you are dead” with Willem’s ambitions to fly, and involves Sasha with the history of the women who flew the spitfires. It’s a fascinating and refreshing contemporary story, which will certainly teach many of its target readership what life is like for other children. It also works beautifully to bridge any gender divide in book sales and readership – hence my book of the week this week. With thanks to Hodder Children’s Books for the review copy. 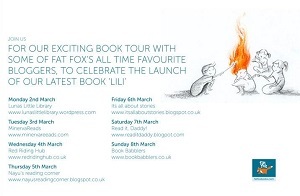 Today I am pleased to be part of the Lili book blog tour. This is a stunningly beautiful picture book with exquisite artworks, but is also a book about how our actions can change other people’s perceptions of us. Lili’s hair is not only fiery red, it is as hot as fire itself. Lili struggles to make friends with anyone because they are frightened of her fiery hair, and is generally shunned. Until the day comes when her hair proves useful in saving some village children, and Lili’s courage shines through. From that day onwards, the other children and people of the village accept and include her. The magic of this picture book is Wen Dee Tan’s amazingly powerful illustrations. Each spread is like a painting on the wall, simple charcoal lines depicting the whole story, bar Lili’s hair, which is a raging fire of orange burning through each page. Not only does it appear fiery, it truly looks like hair – the reader is enticed to touch it, although knows that it is fiery hot. It’s challenging, and yet simple and enriching for a young reader. 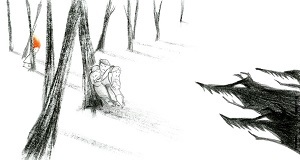 There is simplicity in the drawings throughout – both in the faces of the children, but also in the implied terror when the village children are lost in the woods. 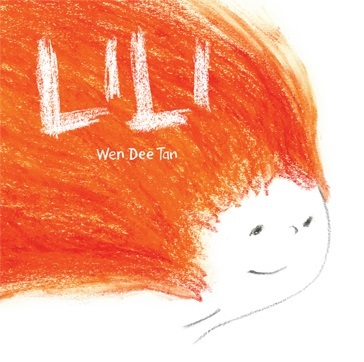 Author and illustrator Wen Dee Tan won third place in the Macmillan Prize 2013 for her Lili illustrations and on her blog talks about the joy of holding a pencil and making marks on paper. She’ll certainly be making her mark on the children’s picture book scene with Lili. You can visit Wen Dee Tan’s blog here. Two other visually arresting (yet in a completely different way) picture books in which the opinion of someone is changed based on their actions are Mr Big by Ed Vere and How to Hide a Lion by Helen Stephens. Mr Big buys a piano because it looks alone, like himself, and his sadness inspires him to play beautiful music. Everyone else in the city can hear the music and recognises its beauty but they don’t know who is playing. They invite the ‘mystery pianist’ to join a band, which he does, and subsequently he becomes hugely popular. It’s a lovely story that explains that friends come in all shapes and sizes. 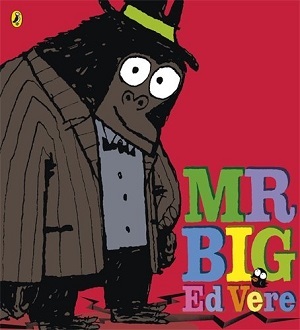 Ed Vere’s book explores emotions in a simple way for picture book readers, and his use of bright colours in his unique style make this book stand out. I haven’t yet read it to a child who didn’t love it and ask for a re-read. 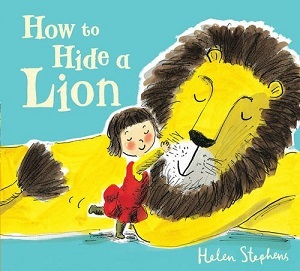 How to Hide a Lion by Helen Stephens is very different although the underlying principle is the same. Just because something is ‘other’, doesn’t mean it has negative attributes, and somebody’s actions can change our perceptions of them. A lion strolls into town to buy a hat, but the townspeople shy away in horror. In fact Helen Stephens depicts a rowdy mob chasing the poor misunderstood lion with brooms and rolling pins. A small girl called Iris is not scared and takes him in, hiding him from her parents as apparently “mums and dads can be funny about having a lion in the house”. In the end the lion is discovered and runs away again, only to foil burglars at the town hall. His good deed is rewarded – he is hailed the town’s hero and given what he came for the in first place. It’s a clever little story with endearing illustrations. 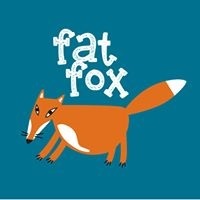 With thanks to Fat Fox Books for the sneak preview of Lili. I wasn’t writing my blog in 2014 (well not until the very end), so in order to catch up with the new brilliance emerging in picture books, here are some of my favourites from last year. The good news is that now it’s 2015 they should all be appearing in paperback sometime soon if not already. Note that many of these are not just for 4-6 years, many 8 year olds have enjoyed these equally, if not more, and teachers will love the rhyming language, clever plot devices and nuances of some of them. Others can be studied for style alone. Top billing for this book in which a disdainful cat explains to a frog where he ought to sit. This book is totally hilarious – worth reading over and over again, particularly if you can get the tone of voice right for the cat. It’s a rhyming book, inspiring children to shout out the punchlines before you get to them. The beauty of the book is the extreme simplicity of the concept –which animal sits on which object? 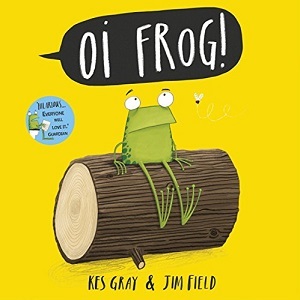 The cartoon-like illustrations of the animals will have everyone in fits of laughter from the beginning endpapers of the frog to the lambs sitting on jams, the bees sitting on keys, the pumas sitting on ….. – no, I shan’t give it away. Buy the book! This is a picture book where the pictures are everything (and no wonder as the illustrator is none other than the New Yorker illustrator Christopher Weyant). You Are (Not) Small attempts to explain relativity to children. Not a detailed theory of Einstein, but simply that everything is relative depending on your standpoint. Two hairy nondescript creatures argue over whether one is small or one is big until a bigger creature comes along, and some much smaller ones too – and suddenly big is not big but smaller, and small is not small but bigger. Confused? Without pictures it’s easy to be, but with pictures it’s not only clear but also hilarious. Two astute punchlines at the end make this a giggle for the children, as well as an interesting lesson. 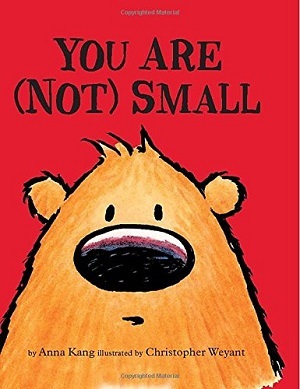 Another picture book on the topic of size, and with amazing illustrations – but this is quite different from You Are (Not) Small. Little Elliot is an overwhelmingly cute elephant, but small of size. He lives in a big city – Mike Curato has drawn almost Edward Hopper-like New York cityscapes – old fashioned with towering city blocks and a bustling subway packed with people in hats. Elliot can’t manage in the big city, even struggling to reach the counter to buy a prized cupcake in a pink cake box. Then he bumps into someone smaller than him (a mouse), and by doing this mouse a good deed, feels as if he is the tallest elephant in the world. The landscape changes abruptly to reflect his mood. 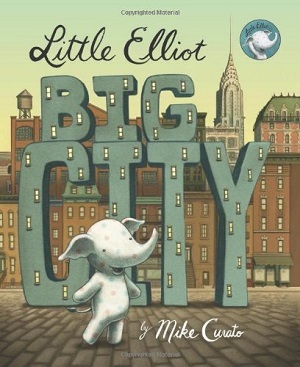 This is a highly stylized depiction of size, with a huge emotional impact, especially when we discover that Elliot has not only gained confidence, but gained a friend. Far, far from the city, this picture book also packs a punch emotionally, but the setting couldn’t be more different. On Sudden Hill is set in a deliberately unrecognisable everyman’s countryside, where rabbits and chickens frolic in the long grass. Birt and Etho are two boys who climb up Sudden Hill to play their imaginary games with each other. Then one day a third boy arrives, but his arrival has difficult consequences for Birt, who seems to have lost his “two-by-two rhythm”. He shows his frustration in anger, and then withdraws, and it takes a while before the boys can find their new “three-by-three rhythm.” The illustrations are almost whimsical in the way they hark to a childhood time of freedom, of swinging in trees, larking with discarded materials, and seemingly having all day to play under the sunshine. As in Little Elliot, the drawings are of an American landscape and the story delivers a fine message. A definite two-by-two rhythm here as Sam and Dave are two small boys working towards a goal together. There’s a camaraderie between the two that one imagines is shared between author and illustrator, as the text and images play off each other to make the jokes. The images are in muted colours in the same way as the boys’ conversation is sparse and unembellished. As On Sudden Hill it relates to a childhood where all day could be spend digging a hole just for the sake of doing it. The reader is let in on certain jokes from the illustrator while the boys dig deeper and deeper. 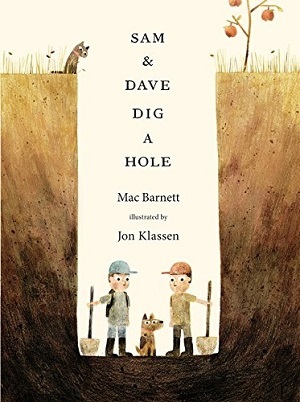 The whole text, images and pages from the very beginning to the very end need exploring for the reader to fully understand the whole context, the in-jokes and where Sam and Dave get to with their hole. Nothing to be given away here – you’ll have to buy it. Another hole, but this one is a complete mystery. Rebecca Cobb’s protagonist (described as a boy on the publisher’s website although to me the cleverness is that the child could be a boy or a girl) loses his ball down a hole in the garden, and spends the rest of the book imagining (with the help of friends and family) what could be down the hole. 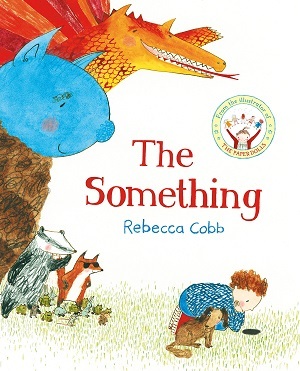 The book comes alive with the small deft touches at which Rebecca Cobb is so brilliant, the cowardice of the father figure, the imaginary mouse house beyond the hole, the diverse group of friends, the animals whose actions mimic those of the grandparents. 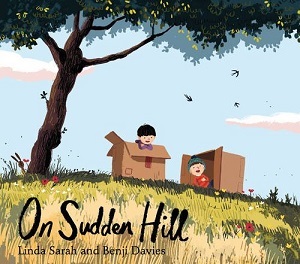 This is a surprising and wonderful picture book, which, like On Sudden Hill, captures the power of imagination, and the beautiful landscape of the outside. The power of colour screams from this blue book. This deserves a slow read – the text is almost a by-product, as all the action, characterisation and plot occurs through pictures alone. It’s a clever device, and if savoured, will result in your children clutching themselves in laughter. It did mine. Four hunters attempt to capture a bird, and fail every time. It’s a classic convention, yet executed in a stunning format. Each page is tones of blue – both hunters and landscape – the only extra colour being the hunted bird. Chris Haughton has a very distinctive style and he uses it to aplomb here. 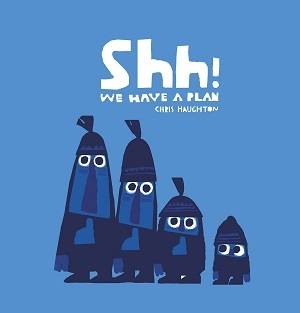 Again, an interesting use of colour for Peter Brown’s book, which as in Shh! We Have a Plan shows plot development through picture rather than text. The colours throughout are shades of brown and green – slowly turning to some turquoise and blue, and like Chris Haughton, Peter Brown’s style is truly distinctive. Initially Ms Kirby, the teacher, is portrayed as quite a monster. She roars in class, and stomps about with threatening behaviour. But then Bobby, from class, bumps into his teacher in the park at the weekend, and gradually they get to know each other. Bobby rescues Ms Kirby’s hat when it’s whipped away in the wind – and Ms Kirby suggests they fly paper aeroplanes – the same deed for which she had scolded her class earlier in the week. 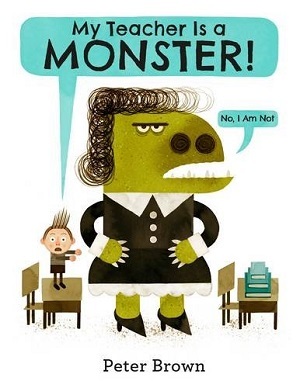 Then before his and our eyes, gradually her monster features are softened, and then disappear altogether through Peter Brown’s clever drawings, until in the end we see that she’s an ordinary lady. Peter Brown is showing us how we fear the unfamiliar, but if we overcome the otherness, then no fear remains. 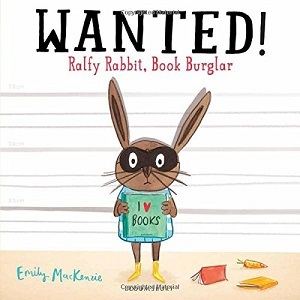 Reminiscent of many other books that demonstrate a character’s intense love for books (see Bears Don’t Read by Emma Chichester Clark, and The Snatchabook by Helen Docherty), Ralfy Rabbit is another addition to the book lover’s library. However, Ralfy Rabbit stands apart for the massive attention to detail in the pictures and text. His lists of books will have adults chortling (The Rabbit with the Dandelion Tattoo), just as much as the children will be oohing after the cute rabbit pictures. Ralfy Rabbit loves books so much that he starts stealing them. Arthur is a little boy who discovers who is stealing all the books, but no one will believe him. His teacher’s attitude is astute and funny: “I want you to go away and have a long, hard think about what you are saying”, as is the bunny line-up when Ralfy Rabbit is eventually caught. The punchline – that a place exists from which you can borrow books – the library – is truly apt for our times. Let’s hope Ralfy Rabbit and public libraries have the longevity they deserve. Another picture book that explores the value of books is Sloth Slept On. When two children discover a sloth in their garden, they attempt to find out where it comes from – of course it doesn’t tell them – it’s always asleep. After coming up with a myriad of possibilities using their wild imaginations, they discover the answer by looking in a book and on a globe. Then the children need to work out how to get the sloth home – with interesting consequences, and a particularly funny punchline, which is alluded to throughout if you pay attention. 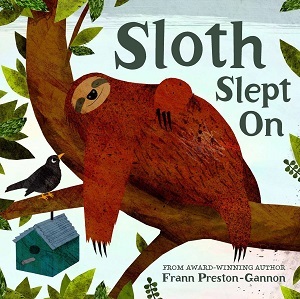 The illustrations are adorable – from the sloth’s upturned mouth while it sleeps to the two playful and curious children. A winner for younger children. Teaching children about traumatic events in our collective history can be difficult, and when picking a book on the subject it’s more important than ever to judge content more than appearance. There is fierce debate on how old children should be before they are taught about the Holocaust or other genocides. Teaching the historical context of the Nazis, of death and what’s morally right and wrong can all be taught much earlier, but it’s hard to teach the meaning and mechanics of mass murder before secondary school. Even some adults have a hard time grasping the enormity of it. The national curriculum dictates that the Holocaust should be taught in key stage 3 – Year 7, 8 or 9, which is the first three years of secondary school (ages 11-14). Firstly, I’ve chosen three works of fiction. They are all picture books, but that doesn’t mean they’re for small children – in fact they are best for age 10+ yrs. I’ve chosen them for their exploration of the Holocaust from different viewpoints, and as starting points for serious discussion about the Holocaust. None of them should be read in isolation, but rather explored after an initial insight into what did happen to the Jewish people during the Second World War. This is a cat’s eye view of Kristallnacht. Benno is the neighbourhood cat, who visits Sophie on Shabbat, and is fed schnitzel by the Schmidts after church, and gets titbits from the kosher butcher. All is seemingly well. Then gradually Benno realises that there are fewer scraps, and the neighbourhood people are growing ever more impatient, and that there are now new black boots stomping along the pavement. 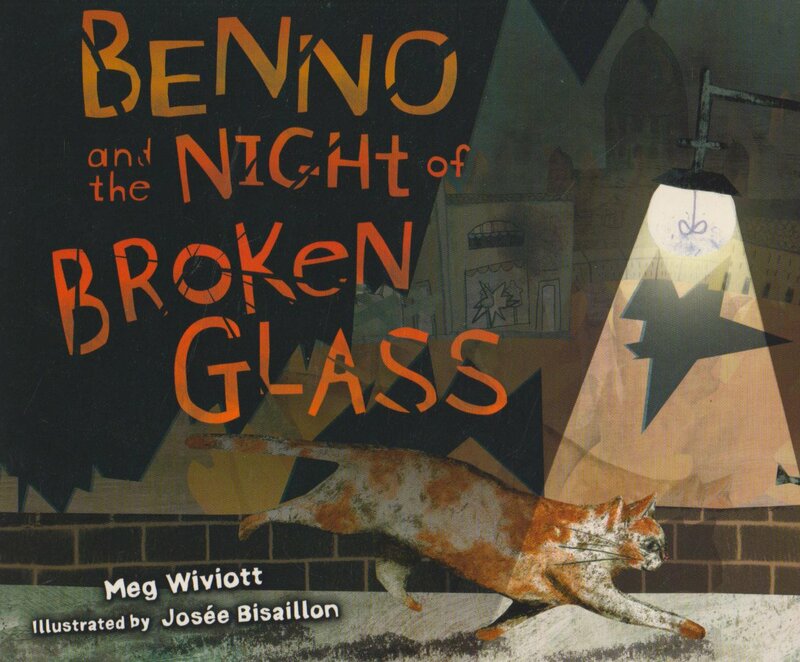 Then Kristallnacht happens, Benno’s paws are sore from the broken glass on the pavement, and Benno doesn’t see Sophie and her family any more, nor Professor Goldfarb. It’s a simplistic animal tale of a neighbourhood changing, but the masked horror of the Holocaust pervades the story. The implied disappearance of the Jewish people of the neighbourhood leaves it up to the reader to imagine what may have prevailed that night. The Afterword explains Kristallnacht in a little more detail, telling what that night was about and what did happen to the Jews in Germany. However, the last paragraph is a little emotive, which is a shame for a page that should remain factual. However, it is a clever introduction to the build-up of the Holocaust in Germany. 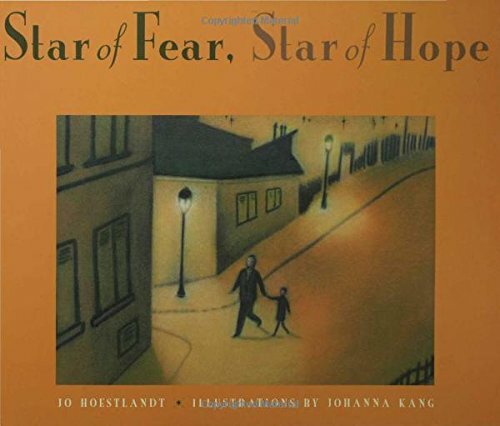 Another simplistic story, which belies the terror underneath, is Star of Fear, which tells the narrative from an old lady’s point of view – looking back on those things that she couldn’t comprehend as a little girl. Helen remembers growing up in France after the German invasion of 1942. She remembers her childhood friend Lydia, and the yellow star Lydia was forced to wear on her clothes. It’s a story about friendship, and how little girls can say things to their friends that they don’t mean – and ultimately live to regret. Helen regrets more than most, as in a spontaneous angry outburst she tells Lydia that they are no longer friends, little knowing it was the last time she would ever see her…it is supposed that Lydia was taken away by the Nazis the next day. The simplicity of the text and pictures adds to the poignancy. 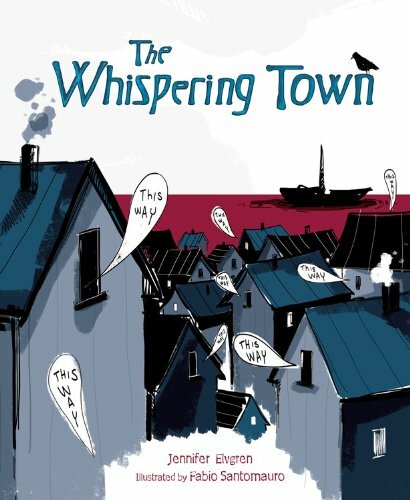 Published last year, The Whispering Town tells the story of the Danish Jews through the eyes of a little girl. The Danish story itself is quite remarkable. As a nation Denmark actively resisted the Nazis’ plan to round up the Jewish people, and managed to smuggle a huge percentage of their Jewish population to safety in Sweden. They relied upon the goodness of their people, and The Whispering Town shows how the shopkeepers and neighbours all helped the hidden Jews in one cellar in Gilleleje to escape by boat from the harbour. The illustrations depict the Nazis as menacing, gun-wielding soldiers and the Danish people with simpatico faces. Cleverly, the Jews hiding in the cellar are simply white pen lines on black – a shadow almost. The colours throughout are muted – pale greens, much black and grey – other than the stark red of the Nazi symbol on the soldiers’ shirtsleeves. This may be a story of hope and salvation, but the events happened in a terrible time. My feeling is that it’s important to teach children that there is hope despite the horror of six million Jews and many other people losing their lives during the Holocaust. It is vital that children understand there are pockets of goodness and humanity. If a whole nation can rise up against the Nazis, then it is possible for goodness to overcome. This link describes the Danish efforts well. After a wealth of discussion of story, it is worth consulting some reference too. One such title that sets things out clearly and easily for children is Usborne: The Holocaust. In a matter-of-fact tone, but with excellently precise vocabulary, Susanna Davidson sets out the narrative of the Holocaust, encompassing the roots of anti-Semitism, the Nazi definition of whom they defined as being Jewish, the treatment of other minority groups, the advancement of Germany through Europe, the increasingly harsh treatment of Jews and minorities, before going on to address ghettos, and the final solution. It also covers small acts of defiance in the face of certain death, both from Jews and non-Jews, which is really important. It’s simple to understand, crams a mass of information into short digestible chunks, and does its very best to explain a seemingly inexplicable event. Despite its conciseness, the book does contain graphic information on the killing of Jews, including shooting at mass graves and the death camps. It also quotes people from the time, and includes graphic images, including the painting ‘Gassing’ by Auschwitz survivor David Olere. There are many photographs too, including those of a survivor at the liberation of Belsen. 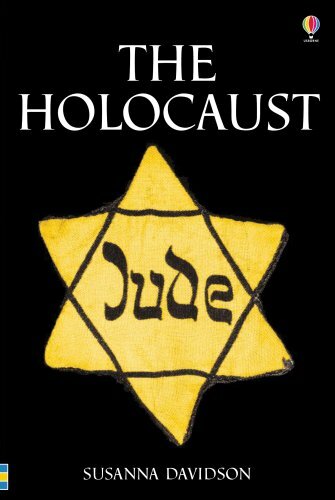 Be warned, this is not a book for young children, but would do well to accompany those studying the Holocaust at Key Stage 3. The afterword throws up some questions that children may ask afterwards, and doesn’t try to answer them, but instead finishes on the note that the Holocaust is not something that should ever be forgotten. I’ve not included a comprehensive review of DK Holocaust, a title that I worked on myself, as sadly, it appears to be unavailable at most good bookstores. 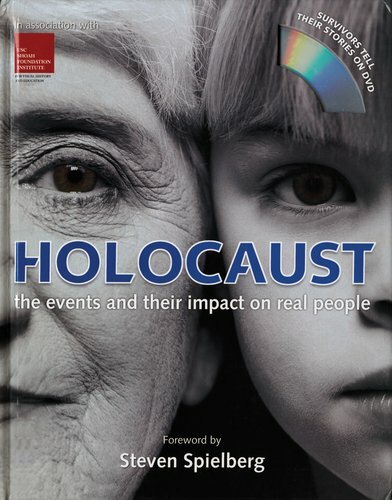 However, if you can get a copy it’s an all-encompassing examination of the Holocaust for older children, which I worked on with the superb writer Angela Gluck Wood. I can self-promote shamelessly as I receive no royalties. Holocaust Memorial Day is on January 27th. Libraries: Here Today, Gone Tomorrow? My local council is proposing to close my public library. I’m not alone – this is happening all over the country. My blog isn’t political though, so I’m not going to explore our campaign, although if you’re interested please go to the links at the end. According to the National Literacy Trust a child who visits a library is twice as likely to be a fluent reader as one who does not. There is a flush of excitement on the faces of the children who come into my library for library club. They are keen to read, to push open the doorway to their imaginations, to discover mindblowing facts and to share them with me. We learn new words, read incredible stories, laugh at jokes, and gasp at information. This week in the library we discussed the word ‘shone’, we giggled that mice park their boats at the hickory dickory dock, we discovered that you can have a trip to the moon, a pet monster, pirates and a genie’s lamp all in one story (Monstar Marks a Wish by Steve Cole, illustrated by Pete Williamson), and we learned that the study of clocks is called horology. The author SF Said says that libraries are cathedrals of books, temples of information. My library constantly surprises me. It’s a treasure trove of inspiration and creativity. “The boys and girls loved Homer. Otto is a bear, but like Homer the cat, also on the prowl for a place of refuge, acceptance and books. 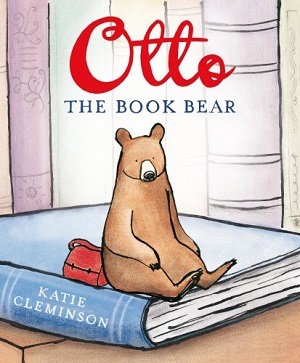 Otto the Bear lives within a storybook, and is happiest when the children are reading his book, but he also comes to life when they’re asleep. Sadly, one day the children move away and Otto is left behind. The story follows his adventures as he struggles to find a safe, welcoming sanctuary. He finally discovers a “place that looked full of light and hope.” Of course, it’s a library, and Otto discovers books, other book creatures like himself, and of course many many readers. Simply told and illustrated, this is a heartwarming story to introduce the youngest audience to a love of books. This exquisite, slightly longer picture book, pitched at an older age group, features a library’s set of rules: no running, quiet at all times etc. One day a lion appears in the library, but he doesn’t break the rules and he appears to want to help the librarian, and so he becomes a regular fixture, helping small children to reach books, providing a back rest during storytime. Until, the day when he does break the rules of the library, and not able to overcome his own shame, he leaves. The librarian and the people in the library are distraught – he broke the rules for good reason, and so in the end he is sought, found and welcomed back. The soft images are suffused with light, warmth and pathos – this is a stellar example of library envy – you almost feel you want to jump into the book. 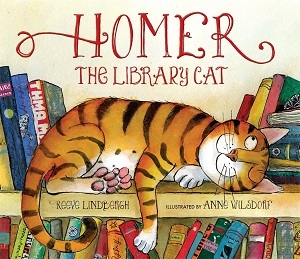 There is also a distinct cleverness in this book – for although a picture book – the portrayal of the librarian is so strong, that you really feel you know Miss Merriweather’s character by the end of the book. 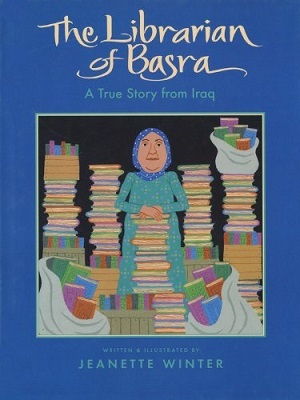 Another lady librarian, this is a careful depiction of the true story of Alia Muhammad Baker, a remarkable woman who did all she could to save the wonderful books in her library from destruction as bombs rained around her in Basra, Iraq. In fact she saved 70 per cent of the books in her library, at considerable danger to herself. This is a great story for children aged 6 and over to explore the impact of war, to discover that one should stand up for one’s beliefs, and have courage in the face of danger. Ultimately, it speaks to everyone about the power and importance of books, and preserving culture and history. It tells the story incredibly simply, leaving out lots of details, but the scarcity of words adds to the atmosphere and lends itself to being read by children – the true circumstances of the war would be too cumbersome at this age. Illustrated with bright bold acrylics, it also gives children a sense of a culture from a different part of the world. There is an author’s note at the end to give background information. So first there was snow – and then there were penguins. I’m not sure when penguins became synonymous with Christmas, but this year they certainly have – from the John Lewis advert to the Penguins of Madagascar, Penguins have arrived in London in time for Christmas. My overall abiding love for this book is one illustration that depicts a facial expression, in which a close member of my family is THE expert. Penguin tells the story of a boy called Ben who receives a penguin as a present, but the penguin will not communicate with him, no matter what Ben does. Finally Ben is eaten by a lion, the penguin saves him, and the penguin suddenly has a great deal to say. 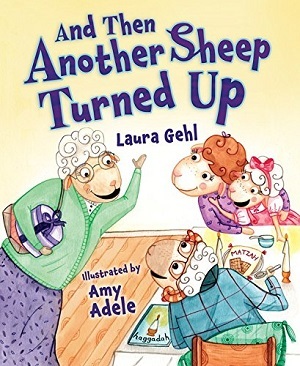 The book is packed with witty illustrations, a zany storyline and a winning outcome. An old favourite. Penguins are often used as a way to explore and develop friendships in picture books – I wonder if that’s because they are often depicted huddling together? Two perfect examples of penguin friends are Fluff and Billy Do Everything Together by Nicola Killen and Lost and Found by Oliver Jeffers. So much expressed so simply – the vastness of the ship and the world as compared to a small boy asking for help. The new addition to the ‘penguin’ canon of literature, and published in August of this year is Blown Away by Rob Biddulph. I implore you to find and read a copy. Rob Biddulph’s blue penguin may be more ‘Hampstead Heath’ inspired than normal Antarctic penguins, but, like Jeffers, his penguin is simply drawn – Biddulph too remarking that children can put their own emotions into the animals, so simple black dots for eyes work best. With rhyming text, Biddulph explores what happens when Blue the penguin gets blown away on his kite, picking up cargo along the way, and finally setting down onto a jungle island. But does he want to stay? The beauty of this book lies in the small details. Every page is lovingly created so that your eyes pick up the story and the animals’ emotions almost by osmosis – the rhyming text is lovely to read aloud, but the extra touches on the illustrations won me over. A charming Christmas present that’s not just for Christmas! My last picture book is Dragon Loves Penguin by Debi Gliori, shortlisted for the 2015 Red House Children’s Book Awards. I coordinate the testing in my area for this award, so know very well how popular this book has proved with young children. It celebrates diversity, and is even relevant for those attempting to explain adoption to the very young – in essence it’s about mother’s love. When an egg is abandoned, a dragon without its own egg adopts it, but when it hatches it’s a penguin! Despite the differences, the mother dragon loves the penguin as her own, and the love makes the little penguin brave enough to see off her dragon peers who can’t accept her differences, and also to escape an erupting volcano. Yes, this little picture book is packed full of action – and has adorable illustrations – rarely has a penguin chick looked quite so cute. For those children who want to find out even more, and for adults who can’t tell the difference between an owl and a penguin here are two great non-fiction titles for early learners.The Emperor’s Egg by Martin Jenkins, illustrated by Jane Chapman, is part of the Nature Storybooks series – telling the story of the Emperor penguins. It’s an excellent starting point for a young child wishing to find out more information. It’s not patronising, but is written as if the child is having a conversation with the writer about penguins. Asking questions of the young reader, particularly ones that make them think, is a lovely way to write a non-fiction book. No wonder this won the TES Junior Information Book Award. The Usborne Beginners series has a book on penguins; I like this series for their gentle introduction to non-fiction. Helpfully containing a glossary and an index, and with short chunks of text throughout for easily digestible facts. It also covers many different types of penguins. Usborne have also had their facts checked by experts in the field, which sadly, is not true of all children’s non-fiction in the marketplace. I wanted to highlight eight books for the Jewish festival of Chanukah, which starts on Tuesday evening, because that’s how many days the festival lasts. However, I got a bit excited, and found twelve! I don’t think this is a bad thing though, as living in London, I get asked for books that celebrate different faiths and cultures quite frequently, and you can never have too many. Chanukah celebrates the miracle of an oil lamp lasting for eight nights rather than one, and the rededication of the temple in Jerusalem following the victory of the Jewish Maccabees over the Syrian-Greeks in 165 BC. For the very youngest in the family I heartily recommend My First Hanukkah Board Book (unashamedly self-promoting here as I wrote this book with Dorling Kindersley). An excellent pictorial introduction to Chanukah, with the story of the festival told in the most basic way and the cultural symbols photographed to ensure a growing familiarity with the festival. The festival’s main song is also included with the Hebrew words spelt out phonetically in English for the youngest reader to follow. Sadly out of print now, but there are some copies floating around. Another basic introduction is Eight Candles to Light by Jonny Zucker and Jan Barger Cohen. Simple illustrations rather than photography, and a handy guide to which way to light the candles (for those who forget on the first night every year!). At the back of the book there’s also a text only adaptation of the story of Chanukah, which is one of the clearest I’ve read. Maccabee Jamboree: Hanukkah Countdown by Cheri Holland, illustrated by Roz Shanzer, is a lovely way to celebrate the festival with small children. It’s a simple counting book starting with eight Maccabees, who one by one disappear as they prepare to celebrate Chanukah with a party. Some children may find this a particularly difficult time of year, as not celebrating Christmas really marks out their difference; it can be hard to know what to say when strangers in shops ask you ‘What are you hoping for this Christmas?’ and ‘Have you decorated your tree?’. One wonderful book that manages to encapsulate that difficulty and celebrate diversity is The Only One Club by Jane Naliboff, illustrated by Jeff Hopkins. It tells the story of a girl called Jennifer who is the only one in her class who celebrates Hanukkah, and makes Hanukkah decorations whilst everyone else makes decorations for Christmas. Throughout the book though it becomes apparent that everyone has something that is ‘unique’ about them and that each child has their own ‘only one club’ individuality. By the end Jennifer doesn’t feel so ‘marked out’. For those who celebrate both Chanukah and Christmas, or Chrismukkah as it’s known in the States, Light the Lights! A Story about Celebrating Hanukkah and Christmas by Margaret Moorman fits the purpose. Totally secular, the story follows Emma and her family as they follow the traditions of first Chanukah and then Christmas, with lights on the chanukiah and then on the Christmas tree. It’s very limited and doesn’t try to explain the significance or story behind either festival, but is a good start for those who celebrate both without adhering to one faith in particular. Also on this theme is Daddy Christmas and Hanukkah Mama by Selina Alko – you can’t get more of a mash-up than the recipe within for cranberry kugel. My new favourite is Sadie’s Almost Marvellous Menorah by Jamie Korngold, illustrated by Julie Fortenberry. Every child can sympathise with Sadie, who, at school, makes a beautiful menorah out of clay ready for the festival, only to break it on the way home to show her mother! Upset ensues, until Sadie’s clever mother shows her that the ‘helper’ candle – the shamash – which is used to light all the other candles, can still be used to light all the other candles on the family menorahs. If only most children were so easily appeased when their artwork gets destroyed! Three books that elucidate some of the qualities of the festival by telling stories are A Chanuka Story for Night Number Three by Dina Rosenfeld, illustrated by Vasilisa and Vitaliy Romanenko, Lots of Latkes by Sandy Lanton and illustrated by Vicki Jo Redenbaugh, and Engineer Ari and the Hanukkah Mishap by Deborah Bodin Cohen, illustrated by Shahar Kober. A Chanukah Story for Night Number Three tells the tale of a boy whose birthday is on night three of Chanukah and is determined to make it special by making the largest latke in the world. The moral framework of ‘sharing’ lies behind the story, which is a good distraction from the increasingly materialistic nature of the festival. It is full of humour and hilarious illustrations (particularly the one of cleaning the kitchen). Lots of Latkes by Sandy Lanton is the story of when the preparations for a Chanukah party go wrong, and each guest brings the same food to the party. The story is a sweet tale, but presupposes knowledge about the festival. 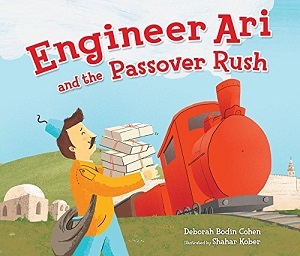 Engineer Ari and the Hanukah Mishap is part of a series of adventures of Ari and the Jewish festivals, but can be read as a stand-alone story. Ari is travelling home for Chanukah, gathering what he needs on the way and meeting a host of people who inform him about the story and traditions behind the festival. He’s delayed by a camel on the line at Modi’in though, and invited in by a local Bedouin, with whom he celebrates the first night of Chanukah. It aims to show that miracles, such as that which happened in 165 BC, still happen and that sharing the festival is a good way of celebrating it. “Does he fidget and fuss through the candlelight prayer? Perhaps a touch contrived, but actually the familiar format is a winner for me. Lastly, National Geographic have a series of books that aim to show how different holidays from different religions are celebrated round the world, without going too far into the religious aspects. Celebrate Hanukkah: with Light, Latkes and Dreidels (Holidays around the World) by Deborah Heiligman highlights the main components of the festival, including the story, the food, the games and the lights, but what sets it apart is the beautiful photos of people celebrating the festival around the world. Good for Jewish people who already understand the festival as well as newcomers who are learning what Chanukah is for the first time. A note of warning: if you’re searching online for books on the festival, you will find that the festival is spelled many ways in English, so one search may not bring up every book.